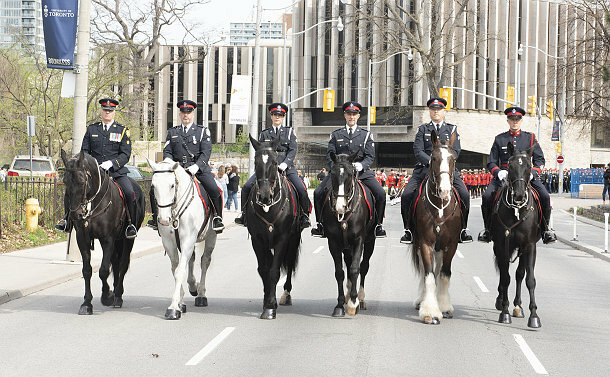 As Deputy Chief Shawna Coxon marched in this year’s 19th annual Ontario Police Memorial at Queen’s Park on May 6, she was thinking of Constable Laura Ellis, who lost her life in the line of duty. Coxon, then a Detective at 42 Division, spoke briefly with Ellis on the night of February 17, 2002. A few hours later, Ellis and her partner, Constable Ronald Tait, were driving to a break-and-enter call when their scout car struck a motorist making a U-turn at a Scarborough intersection. The police vehicle spun out of control and slammed into a utility pole. Ellis, on the midnight shift on her last assignment with Toronto Police before transferring to Durham Regional Police Service, succumbed to her injuries, leaving family, friends and colleagues to mourn her death. Coxon and Ellis were in the same Ontario Police College graduation class. Sergeant David Shaw, who joined the Service 28 years ago and is now at 41 Division, also worked at 42 Division with Ellis. No Ontario police officer has lost their life in the line of duty since 2014. While this is truly a blessing, Premier Kathleen Wynne said, the 266 officers who have lost their lives will always be remembered. 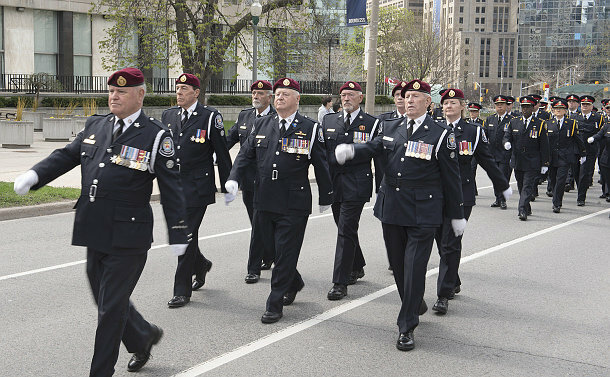 Wynne praised Toronto Police and Constable Ken Lam for the strength, skill and dignity displayed in dealing with the tragedy that occurred in the city on April 23. A total of 10 people lost their lives and several were injured when a 25-year-old man allegedly used a vehicle to target pedestrians. Lam apprehended the suspect without using his firearm. Elizabeth Dowdeswell, the province’s Lieutenant Governor, said Lam has been rightly praised for his courage and calmness under pressure and his measured effective actions in bringing the threat and violence to an end. This year, Ontario Provincial Police officer John Smythe and Department of Highways Leamington traffic officer Almer Wilson were added to the Wall of Honour. On December 9, 1922, Smythe – an immigrant from Belfast who served in the Irish Guards during World War I – and Canada Customs officer Charles Muir were on their way to Port Colborne from Fort Erie to conduct a liquor seizure when their vehicle lost control and overturned. Muir wasn’t injured, but Smythe, 28 at the time, was found deceased under the vehicle. On August 26, 1929, Wilson was on patrol on Highway 3, near Maidstone, when the rear tire of his motorcycle blew out, causing the bike to cross into the oncoming path of a car. He succumbed to his injuries in a Windsor hospital. Ontario Police Memorial Foundation President Rondi Craig said no fallen officer will ever be forgotten. Craig also paid tribute to the 133 American officers who have died in the line of duty in the last year. Staff Superintendent Randy Carter has attended the memorial for the last two decades. Constable William Boyd was the first Toronto officer to die in the line of duty in 1901. While transporting prisoners, he was fatally shot by an escapee.